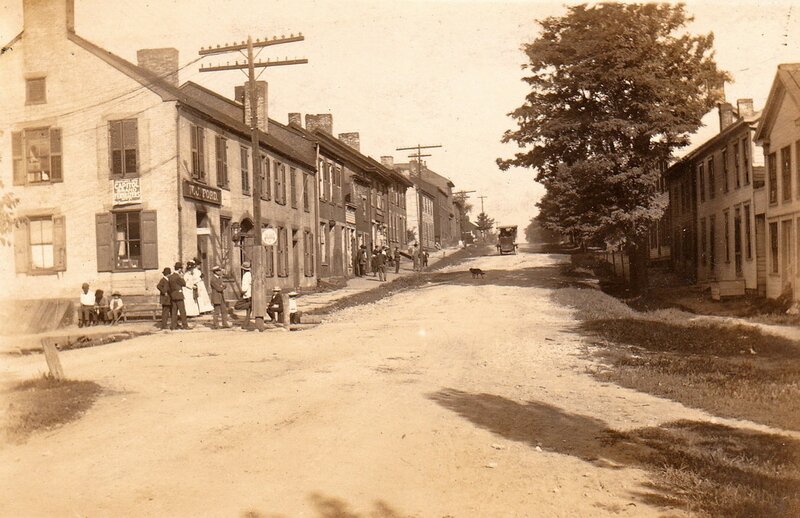 "In 1800, Joseph Talbott, a Friend, settled on the site of Richmond, having purchased a quarter section of land from Bezaleel Wells in 1799, but he did not lay out the town until 1815. This year he employed Isaac Jenkins to survey the land for lots, 60x160, with streets 60 feet in width. The first house was built by Benjamin Hartman who opened a tavern and also followed blacksmithing. The first store was kept by Allen Farquhar, and the first physician was Anderson Judkins. The village was incorporated in 1835; John Tyball and Samuel Hanson were elected Justices and James Ball, Clerk. Adam Stewart was the first Mayor, James Riley, Recorder; William Farmer, Thomas Burns, Henry Crew, John McGregor, E.M. Pyle, Trustees." "In the year 1799, Joseph Talbott bought of Bazaleel Wells, the northeast quarter of section 10, township 10, range 3, for which he paid $2.50 per acre. The next year (1800) he settled upon the land, and in 1815 employed a surveyor named Isaac Jenkins to lay out a town, street 60 feet wide, lots 60x160 feet. 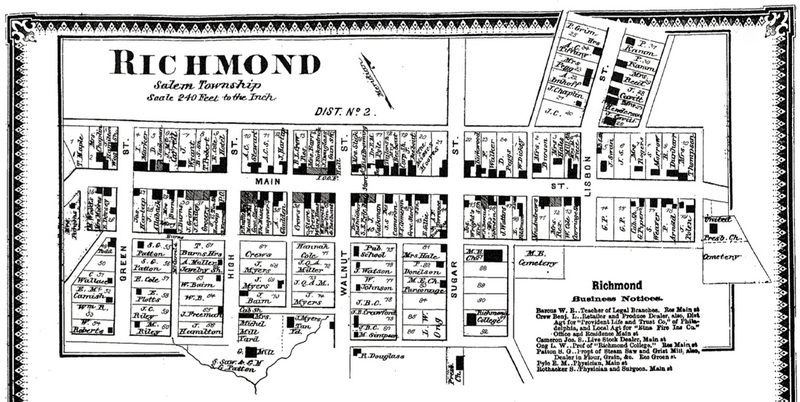 The work was completed September 20, 1815, and the new town named Richmond. The first house was a log dwelling, 18x28, built by Benjamin Hartman, who kept hotel and followed blacksmithing. 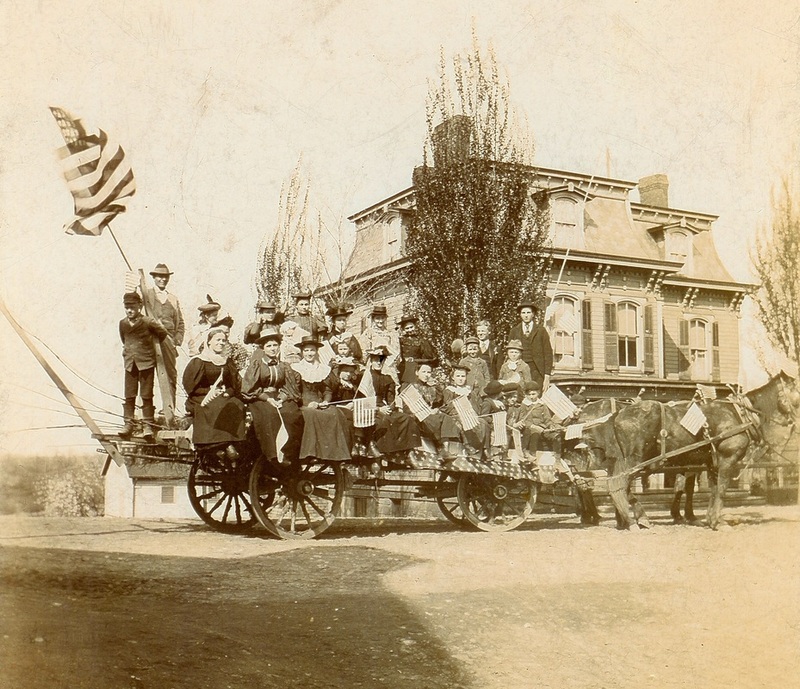 His house was located where Cahill's drug store now stands. Allen Farquhar kept the first store. In 1817 there were five families in the town, viz. : William Talbott, Benjamin Hartman, William McCarel, Anderson Judkins, and William Bahan. Anderson Judkins was the first physician. 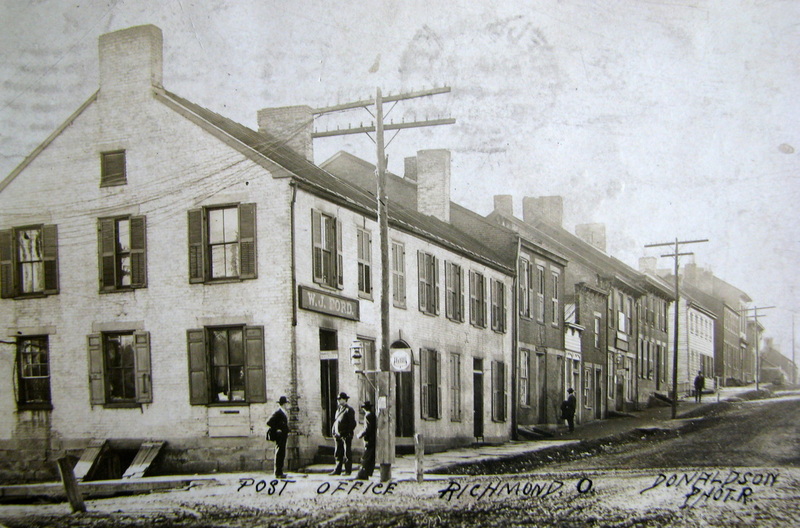 Richmond was incorporated in 1835." "Richmond, a thriving post town in the western part of Salem township, Jefferson county, about 11 miles west from Steubenville, the seat of justice, and about 9 miles in a direct line from the Ohio river. It was laid out in the year 1815, by Joseph Talbot; but since that time its original limits have been largely extended by what is called "Shelly's addition." The situation of Richmond, in regard to the general features of the circumjacent country, is high and healthy, with pure atmosphere and generous soil. Since Shelly's addition to the original survey, the town has considerably improved in point of population, and wealth; and from present appearances, bids fairly to attain a commanding position on the map of the state. It contains at present, about 300 inhabitants, four stores, three taverns, a post office, a printing office, a large brick meetinghouse, and a brick school house. Two daily lines of stages pass through it--one from Steubenville to Canton, in Stark county; the other from the same point to Wooster."